Rx Racing Street Demon Series 485HP Package. Packing List of Included Kit Items. Brand new Street Demon Series turbo package for your vehicle. 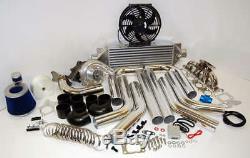 The most complete turbo package available for the price. This package has all new quality parts that are capable of producing well beyond 485 horsepower at 25+ PSI with supporting modifications and a built motor. This is the most complete package available compared to others at an affordable price. On a stock motor the kit will create give the motor a 50-100 horsepower gain on a low boost setting of 8 PSI. Also, the included electronic turbo timer provides a hassle-free operation of precisely calculating the cool down period to ensure a proper cool down for your turbocharged motor. Works with either automatic or manual gearboxes. This kit may allow you to keep your air conditioning and power steering for a great street setup. High quality tubular piping with large primaries. High quality T3 turbocharger flange. Extra thick flange support the turbo well. Fully ported and polished design. TIG welded 321 Stainless steel material for longevity & strength. Strong design supports the weight of the turbo. Full install kit includes all bolts & hardware. Beautifully polished for a show finish. High quality gaskets included for turbo flange & exhaust manifold flange. 57 compressor wheel trim mapped for low and high boost setups. Oil fitting gaskets & mounting studs included. Capable of producing over 450 horsepower. Wet float bearings & properly balanced. 3" inlet diameter with a 2" outlet. Large design cools down the turbocharged air efficiently. Strong TIG welds will support high PSI levels. Extra thick core provides ample cooling. 2.5" cold outlet & 2.5" hot inlet. Less then 2% pressure drop. (1) Universal Intercooler Piping Kit. Lightweight yet strong aluminum piping. May necessitate light modification to fit. (16) stainless steel worm gear clamps. (2) 2.5 90 degree silicone couplers. (6) 2.5 straight silicone couplers. (2) 90 degree 2.5 bends. (2) 60 degree 2.5 bends. (2) 45 degree 2.5 bends. (2) straight 2.5 pipes. Can be setup to adjust boost PSI on the fly. Can be adjusted for any PSI level desired. Includes the mounting tabs for a easy zip tie install. Reversible design can either pull or push air. Versatility of a push/pull reversible fan. Superior flow of a curved-blade design. 1.25 thick outside perimeter. 2.50 thick inside perimeter. Ensures a proper cool down for your turbocharged car every time. Includes pigtail wiring and extra wiring for ease of installation. Important to preventing premature turbo wear and failure. Mounted inside the vehicle for on the fly adjustments. Precisely calculates the cool down period for the motor. Auto mode feature creates a hassle-free operation. Increases turbocharger's operating lifespan. Bright Easy to read LED Digital Display. Failure to reduce the temperature of the turbo could result in "coking" of oil inside the turbo. Coking is the baking of oil, turning it into a grimy substance. (1) 10 Meters Heat Wrap. Heat powers the turbochargers turbine inlet. Keep the heat inside the exhaust pipes. Heat kills the turbochargers compressor inlet. Keep the heat out of the cold piping. Control additional engine bay heat and prevent overheating. Made of very high temp fiberglass. Waterjet cut 5 bolt flange. (1) High Flow Intake Filter. Protect the turbo system from debris. 3 inlet perfectly matching the turbocharger inlet. (1) High Flow Breather Cap. Keeps crankcase ventilation clean for emissions. Works in conjunction with the catch can to keep inside of turbo piping oil free. Monitor the water temperature via this sensor relocation. Easy solution to run aftermarket coolant sensor. Provides more precise readings then the stock location. Features 2 installation clamps for an easy add on. 38mm ends fits most OEM coolant hoses. After that period, a unpaid item dispute will be filed. Box, FPO, APO, HI, & AK. We cannot mark the item as a gift as it is against the law. We cannot mark the item as a lower value as it is against the law. We are the parts supplier, not mechanic. We can try our best to help with generic questions, but it is best to consult a professional turbocharger installer with specific questions. There are no installation instructions included. The install is simple and most customers install it themselves in a weekend. If you cannot figure it out or feel uncomfortable with the installation, please have a professional assist. Most of these parts are direct bolt-ons. The piping needs to be fitted up. Because of the bends and couplers included, it should be simple. The T3 turbo flange needs to be welded to an adapter pipe or directly to the stock manifold. To run this on a street car, the turbocharger down pipe will need to be connected to your existing exhaust. Expect to fabricate an adapter pipe or have an exhaust shop connect them. Eworld is not happy until the customer is 100% satisfied. Please make sure that the part you ordered fits before altering or final installation. Altered items and custom orders are not refundable or returnable. Due to manufacture supply, colors/styles may be slightly different. The item "Audi VW Stainless 1.8T A4 TT Golf GTI T3/T4 Turbo Kit" is in sale since Monday, June 10, 2013. This item is in the category "eBay Motors\Parts & Accessories\Car & Truck Parts\Turbos, Nitrous, Superchargers\Turbo Chargers & Parts". The seller is "eworldsales1" and is located in Troy, Michigan. This item can be shipped to North, South, or Latin America, all countries in Europe, all countries in continental Asia, Australia, South africa, New Zealand.